The mist is lifting from the map of the United States and the moment of clarity for the 2016 general election campaign has arrived. Yes, there is still uncertainty about some states in the Electoral College. But nearly all of it comes in states that Mitt Romney won in 2012 or a couple of Barack Obama states that Hillary Clinton doesn’t need to win. With less than three weeks to go, and all of the debates blessedly in the rearview mirror, Clinton is in a commanding position in the contest to become the 45th president. Clinton has taken a significant lead in national polling and is now up by about six to eight points in two-way and four-way presidential matchups in both the HuffPost Pollster and RealClearPolitics averages. 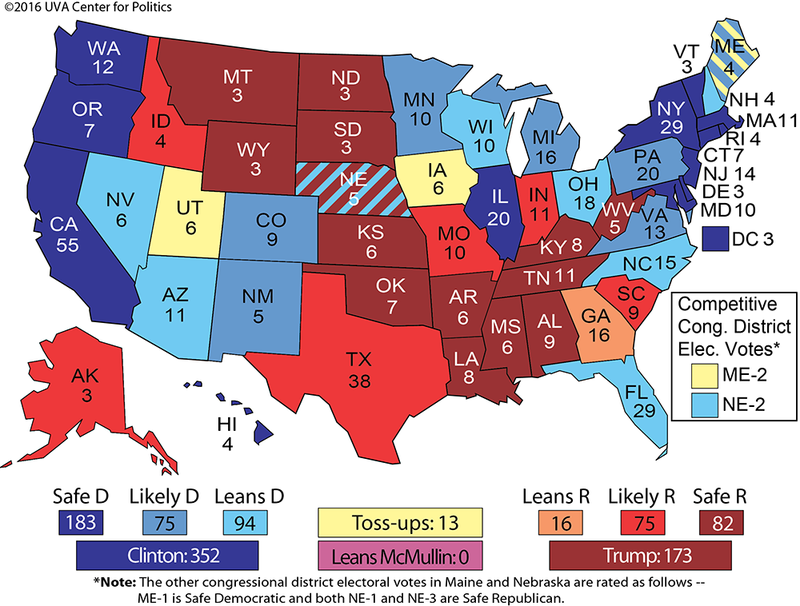 Her leads in the key states that would get her to 270 votes are in some instances smaller than that, but she has a healthy advantage in more than enough states to get her to an Electoral College majority, and smaller leads in states that she doesn’t need but Trump does, including big, typically Republican-leaning prizes like Florida and North Carolina. A few Obama states seem more tenuous for Clinton, including Iowa and Ohio (the latter of which we still lean to her), but if Clinton is up by a fair amount nationally these states get harder for Trump. Clinton’s embarrassment of Electoral College riches may well produce poverty for America’s presidential billionaire. We doubt the third debate will change all that much. The first part unfolded along predictable partisan lines on the Supreme Court, abortion, and other topics, leading to exchanges that reinforced differences between the parties. Based on the breaking news alerts that came out from several news outlets as soon as he said it, we suspect that the biggest story to come out of the debate will be Trump’s irresponsible refusal to say whether he would accept the results of the election if he does not win. If that’s what happens, the coverage will be negative and will be just another distraction Trump can hardly afford with less than three weeks to go until Election Day. Our conclusion is simple. As we reassess our Electoral College ratings, we don’t think any new states are moving toward Trump at this point, and there are some surprising conservative places where he is registering very thin, soft support. A striking development in recent days has been the smattering of polling showing Trump with weak leads in some reliably Republican states. He’s barely ahead in some polls of Alaska, Indiana, Missouri, South Carolina, and Texas — states that shouldn’t be close in any competitive election. We still guess Trump will win all of them, but by significantly reduced margins from Mitt Romney’s 2012 performance. 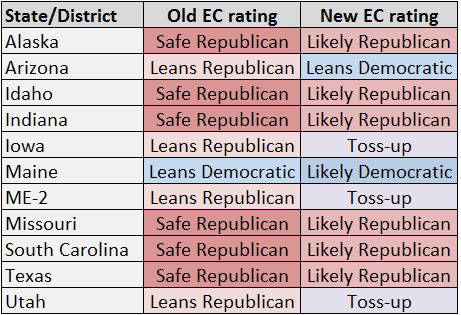 All of these states move from Safe Republican to Likely Republican. The Clinton campaign is set to spend money on Indiana and Missouri, probably as more of an effort to help Democrats Evan Bayh and Jason Kander, respectively, in their Toss-up Senate races. But perhaps most fascinating of all is Utah, where independent conservative Evan McMullin is dedicating much time and energy. After the release of the Trump/Billy Bush video and the mass rejection of Trump by Republican leaders in the Beehive State, we moved Utah all the way from Safe Republican to Leans Republican. Since then, polls have shown a close three-way race among McMullin, Trump, and Clinton. In a state where neither major-party candidate is spending much time or money, McMullin’s cultivation of Utah (he’s a Mormon who went to Brigham Young University) could bear fruit, and he may have the most room to grow in a state where Clinton and Trump are very unpopular. Therefore, we have moved Utah to Toss-up. Seriously, did you ever even for a second think Utah would be a Toss-up in late October? If McMullin won Utah and secured its six electoral votes, he would be the first non-Democrat or non-Republican to win any state since the segregationist George Wallace won a handful of states and received 46 electoral votes in 1968. While some typically Republican states are getting closer, the big red-state prize for Clinton is Arizona. Polls there have been close for the entire general election cycle yet Trump has generally held onto a small, persistent lead. Now, though, a few new surveys show Clinton with a small lead, and Trump may be stuck because he doesn’t have the resources to match the firepower Clinton is directing to the state. Later on Thursday, First Lady Michelle Obama is holding an Arizona event. This is deployment of arguably the campaign’s top surrogate, and Team Clinton is targeting the state in other ways. The Trump campaign’s Arizona crisis reminds us in some ways of how John McCain’s 2008 campaign ended up losing Indiana. Because McCain was at a resource disadvantage against Obama — just like Trump is now outmanned against Clinton — the 2008 nominee could hardly spare any resources to protect Indiana, a typically red state where Obama vastly out-organized and out-spent him. Obama was able to very narrowly flip the state. Four years later, Obama didn’t bother competing for the state, and it reverted to its Republican roots (Mitt Romney won it by about 10 points). Could Arizona work out the same way? This is something of a leap of faith, but we’re moving Arizona all the way from Leans Republican to Leans Democratic. If we were basing this just on polls, Toss-up would be the designation, but we’re trying to project a little bit here. We just don’t see Trump making a dramatic recovery nationally, and he may not be able to fight off the Clinton ambush in a Latino-rich state where he should be solidly ahead. Of all the states that voted for both McCain and Romney, Arizona appears to be the most vulnerable for Trump. We’re also moving Iowa and Maine’s Second Congressional District from Leans Republican to Toss-up. Polls aren’t necessarily driving the movement here — Trump still leads in survey averages in both places, although there is scant recent polling. But we believe that if Clinton is truly up half a dozen or more points nationally, then probably Trump no longer has an advantage in Iowa and ME-2, even though both places are demographically favorable to him (they are filled with the white, blue collar voters with whom Trump has the potential to over-perform). Ohio, too, has a lot of these voters, and public polling there has persistently shown Trump doing well (he leads by less than a point in Ohio in the RealClearPolitics average, while Clinton is up by less than two in HuffPost Pollster). As we’ve previously noted, Trump will do better in Ohio — and likely Iowa and ME-2 as well, for similar reasons — than he does nationally, but our sense is that Clinton remains a small favorite in Ohio, and most of our sources agree. Aside from Arizona, Ohio is the most tenuous Leans Democratic state on our map. If Trump recovers to some degree, these may be the first dominoes that fall to him, along with Iowa and ME-2. Finally, Clinton’s seeming recovery in ME-2 means that Maine’s two statewide electoral votes go from Leans Democratic to Likely Democratic. At the very least, we believe that Clinton’s margin in Maine’s Safe Democratic First Congressional District will be bigger than whatever the margin is in ME-2, which means she’s in a good position to carry the state overall even if Trump grabs the northern district and its electoral vote. Today’s changes push Clinton to 352 electoral votes, the highest we’ve had her in the whole election cycle (her previous high water-mark was 348 electoral votes).